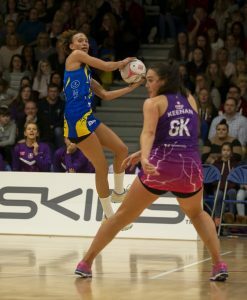 Team Bath Netball overturned a seven-goal deficit and then held off a last-quarter comeback as they defeated top-four rivals Loughborough Lightning 57-55 in a sensational 2019 Vitality Superleague showdown that fully lived up to its pre-match billing. The battle between third and fourth place promised to be an epic encounter and it was all that and more as another four-figure crowd at the Team Bath Arena was treated to a spectacle high on quality, drama and tension. There was nothing to separate the teams in the first quarter but a seven-goal burst during the second period gave Lightning the initiative, only for the Sitec-sponsored Blue & Gold to rally superbly. They closed the gap to three at half-time before a magnificent team performance in the third-quarter, which they won 21-11, put Team Bath into a seemingly comfortable 49-42 lead. Lightning had other ideas, though, and managed to draw level midway through a breathless final quarter but Team Bath dug deep, held their nerve and managed to wrap up three vital points in the race for the semi-finals. Head Superleague coach Anna Stembridge said: “It was a brilliant game, we knew it was going to be an awesome spectacle. We know that Lightning have the attacking power to build a lead and kill the game but I was really proud of the way we stuck to the task and showed such grit and character. Defender Summer Artman, who was Genuine Car Services Player of the Match for a second successive home game, added: “As a team we are finding different ways to win, so we’ll take coming back from a seven-goal deficit. Both teams went into the match on the back of their first defeats in more than a month and were clearly determined to make quick amends. A high-quality first period saw Team Bath got off to a confident start as they turned over Lightning’s centre-pass and took a lead that they held until the closing stages of the quarter. The Blue & Gold were pinging the ball around the court quickly, while Kim Commane and Sophie Drakeford-Lewis combined excellent movement with clinical finishing as the hosts edged into an 11-7 lead with five minutes of the quarter to go. Artman and Eboni Usoro-Brown were applying excellent defensive pressure at the other end but Ella Clark and imposing shooter Mary Cholhok began to work some space and, as Lightning forced turnovers, the visitors were able to claw back Team Bath’s lead. They edged ahead for the first time in the closing stages but a fine finish from Drakeford-Lewis on the buzzer ensured a hard-fought first quarter finished all square at 14-14. The early stages of the second quarter continued to be evenly matched but a seven-goal blitz from the ruthless Cholhok saw Lightning take a stranglehold on the game. The atmosphere was tense in the Team Bath Arena but the home side kept battling away and, with the crowd fired up by two superb interceptions by Usoro-Brown and Artman, they began to work their way back into the game. With Commane providing some fine finishes, Team Bath cut the lead to two before a late goal from Clark ensured Lightning held a 38-21 advantage at the break. 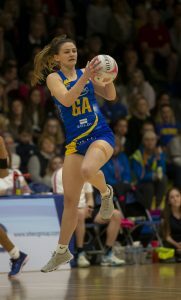 There was a blow for Team Bath in the opening minute of the third quarter as Drakeford-Lewis took a knock and limped off the court but replacement Laura Rudland immediately settled into the rapid pace of the game as she set up Commane for two quick-fire goals. She was also on target twice herself in succession as Team Bath closed to within one goal and, after a phenomenal interception from Serena Guthrie, Rudland scored again to level at 34-34 before putting the hosts ahead for the first time since quarter one. Another Commane double quickly stretched the lead out to three goals and, while Lightning managed to stay in touch, the wind was now very much in Team Bath’s sails. Imogen Allison and Guthrie were dominating the mid-court, forcing a number of turnovers and helping Artman and Usoro-Brown lessen the influence of Lightning’s previously influential attackers. Rachel Shaw, Rudland and Commane were also fluid in attack as Team Bath went on to win the quarter 21-11 and turn a three-goal deficit at half-time into an emphatic 49-42 advantage. Lightning made some attacking changes for the final 15 miites, with Amy Clinton replacing Cholhok at GS and former Team Bath player Jess Shaw – who had come on late in the third period – continuing at C.
It had a massive impact as the visitors produced another brilliant seven-goal burst to draw level at 51-51 midway through an increasingly nervy final period. The game remained in the balance right up until the last couple of minutes before, with Drakeford-Lewis back on at GA, Team Bath finally managed to put together three goals in a row to finally kill off Lightning’s challenge. Next up for Team Bath is a busy Easter weekend which sees them visit South West rivals on Saturday, April 20 (6pm) before taking on fellow semi-final contenders Saracens Mavericks during Super 6 at the Ricoh Arena in Coventry on Sunday, April 21 (6pm). 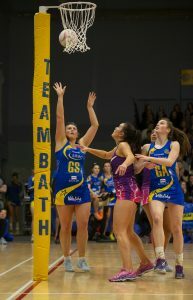 Tickets for both the Mavericks game and Team Bath’s final home match of the regular season – against newcomers London Pulse on Saturday, May 4 (6pm) – are on sale now at netball.teambath.com/fixtures. 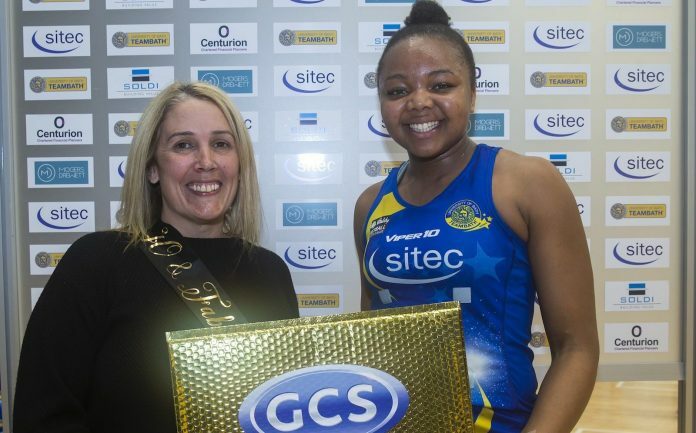 Team Bath Netball starting XV: GS Kim Commane, GA Sophie Drakeford-Lewis, WA Rachel Shaw, C Serena Guthrie, WD Imogen Allison, GD Eboni Usoro-Brown, GK Summer Artman. Replacements: Leila Thomas, Lois Jackson, Mia Ritchie, Laura Rudland, Beryl Friday. Changes: Q3: Rudland – bench to GA; Drakeford-Lewis – GA to bench. Q4: Drakeford-Lewis – GA to bench; Rudland – bench to GA.
Loughborough Lightning starting XV: GS Mary Cholhok, GA Ella Clark, WA Hannah Joseph, C Natalie Panagarry, WD Zara Everitt, GD Vicki Oyesola, GK Tuaine Keenan. Replacements: Amy Clinton, Rosie Harris, Emily Hollingworth, Lucy Parize, Jess Shaw. Changes: Q3: Shaw – bench to C; Panagarry – C to WD; Everitt – WD to bench. Q4: Clinton – bench to GS; Cholhok – GS to bench. Quarter scores (Team Bath first): Q1 14-14. Q2 28-31 (14-17). Q3 49-42 (21-11). Q4 57-55 (8-13). Genuine Car Services Player of the Match: Summer Artman.